this saturday eve at the refuge’s weekend gathering we began the 1st week of advent. we are using an advent guide produced by our friends from urban skye that focuses on the third way, the ways of Jesus, as a backdrop for the upcoming weeks. we all have a natural tendency, when threatened, to fight or flee. when it comes to some of our experiences with “church” i am guessing some of the same reflexes apply. the first way is to respond in violence and anger, whether that’s in the quietness of our hearts or in our actions and words. the second way is to retreat, hide, run, pretend nothing’s wrong or that there’s nothing we can do. the third way is the way i want to learn–an active presence, a hope for what’s possible, a willingness to stay in the conflict & tension and seek God’s direction & wisdom and courage to live it out. so i noticed that maybe that’s what this series “what could be” is all about, me attempting to practice the third way when it comes to “church”. the other day my 15 year old daughter asked me a question that has no easy answer, no cut-and-dried response. she asked “what was there before God?” then she added, “i know God made the world, but how did he come into existence in the first place & what was ‘there’ before?” whoa. the first thing that crossed my mind was whipping out john 1 or genesis 1; the only problem is they definitely don’t properly answer her question. but i resisted the panic that rose up in my chest and the fleeting thought that because i had no good answer that maybe my faith was just a sham & i was actually an atheist, and responded with “julia, way to ask the world’s most profound question that no honest person can fully answer!” right after that, the next question that got fired from the back seat by one of the 9 year old twins was: “i have a question, too: how do we know the Bible is really true?” oh boy, just an average day driving home from basketball practice! apprehension, confusion, disbelief, lack of confidence, misgiving, mistrust, quandry, skepticism, suspicion, uncertainty, reluctance. belief, certainty, confidence, dependence, faith, reliance, trust. okay, which words do you like better, which ones make you feel more secure, less anxious? i admit, as i read these two lists i kind of cringed because i realized how much has shifted for me over the years. i used to think the sign of being a good christian was a rock-solid certainty that i could back up with the right scriptures. now, i think one of the signs of our faith journey is to be willing to wrestle with doubt. to honor it. to recognize that it is part of what makes faith, faith. and as much as doubt is frustrating in our own lives & in the lives of others, i believe that we, the church, need to get better at honoring doubt. this is a place where a lot of people live, people who’ve been around “church” for a long time and people who haven’t. doubt is part of our human experience. we doubt we are loved. we doubt we are lovable. we doubt God cares. we doubt God is good. we doubt all kinds of things, whether we say them out loud or not. in the quietness of our hearts, in the darkness of night, most people wrestle with doubt in some form or another. honoring doubt is a little like welcoming pain, it’s living in the tension and not feeling the overwhelming need to make it all better and tie it up with a neat and tidy bow. julia’s question can never be wrapped up, it just can’t. but the question i have to then wrestle with is “what does that mean for my faith?” can i live with the not-fully-knowing? can i still believe the big story & cling to Christ’s hope while i question a lot of the minutia? a lot of us have been taught that certainty comes from right belief about words in the Bible, that if people could just “believe properly and trust Jesus” everything would be okay. umm, tell that to my friend who’s teetering with sobriety during one of the most difficult seasons of the year. tell that to my friend whose husband just ditched her. tell that to my friend who got kicked out of their church after dedicating years of their lives to building it. tell that to my friend who’s still single after years of hoping to find a partner. tell that to my friend who goes to bed hungry so that her children can eat. tell that to my friend who keeps trying to connect with God but can’t seem to feel him in the darkness. everyone i know doubts. i always think back to the disciples, they were there, in the flesh, and had trouble believing. and here we are, 2,000 years later, trying to make sense of this great mystery & what it means for us, for the world. so how can we be people, communities, who honor doubt (and not just doubt about God but about ourselves, too)? accept doubt as a natural part of our experience instead of resisting it. this is what is freaky for those who are going through a bit of a deconstruction process when it comes to faith. what happens when some of our questions aren’t just a detour back to our usual or customary constructs but actually a journey into the wild outback without a map? i have let myself and God off the hook a bit and reconciled in my heart that some of my doubts will never be fully answered this side of heaven & to quit getting so mad at myself for not going back to somewhere that i don’t think exists anymore anyway. i think we’d love people better if we let go of trying to resolve what can’t be fully resolved & focus on the very simple few essentials instead: love, love, oh, and love. most people don’t doubt the ways of Love that much anyway, isn’t that interesting? yeah, my hope is that we can learn to live in the tension of people’s spiritual journies and give up our crazy need to bring people over to our way of thinking, to not be so afraid, and have faith that God is big enough to hack it. let go of our need to make people understand God’s love the way we want them to. i daily come face to face with how desperately i sometimes want to convince people of certain things (not so much about spiritual technicalities, i am done with that). the doubt that is hardest for me to let go of is when people doubt they are loved. by God. by people. i want to jump up and down and try to convince. “see, see, see! you are loved!” but then i remember in my own life that God’s love, other people’s love, have always been the hardest for me to grasp no matter how much convincing was in the mix. one of the things i am learning to let go of is the false belief i can convince anyone of anything. i’m not one word away from making someone understand Jesus’ love. sure, i can love tangibly, stay in for the long haul, and continually point towards God, but i cannot convince anyone of anything; that job is the mysterious work of the Holy Spirit and i am thankful that he/she is relentless in pursuit. one of the problems i have sometimes seen, though, is that we can get so frustrated with people’s “lack of progress” in this area that we get tired of trying to convince and give up. what if we gave up worrying about convincing and just relaxed & recognized that a natural part of life is to wrestle with self-doubt? a few years ago my friend nadia posted a blog that included a simple picture i always think of: “faith needs doubt like children need love.” my daughter’s question makes me think. and my lack of a wonderful spiritually acceptable answer doesn’t make me throw in the towel; actually it makes me have even more respect for my faith, for the faith of others. faith is way bigger than me, than the walls of a church, than the confines of a particular culture or a denomination, than the lack of an answer to an obviously profound question. the Kingdom of God is uncontainable. and it can stand up to doubt. the question is, can we? God, help us trust that you are big enough for our doubts & help us be people & communities courageous enough to hold the doubts of others. I’m not sure if anything I’m going to say is going to relate exactly to this. But I did love the entry again as usual. if you can even sort of understand it, it’s not God. I really liked that — dwelling on that and some following verses really helped me let God out of what I believed Him to be. But sometimes when He is let out of the box He feels so far away just because of how HUGE He is… but then I remember how intimate He is and I do eventually remember how much He loves & cares for me and the details of my day. Anyway -that really had nothing to do with anything haha. Just sharing. Our church body is going through a huge change trying to let God out of all the shapes we make Him to be. We have so far to go but it’s awesome to see it happening. Sometimes, when I bring new visitors into our class with me I really cringe when I hear the new person have enough courage to contribute to the conversation only to have somebody respond quickly like, “oh no that’s not true, the Bible says”… there’s just a way of teaching… a way of guiding a way of informing and so few really know how to do it. I’m not saying I know either — but I just know that yes we are called to stick up for the Word and called to teach others…. BUT I think that isn’t a one time event. It’s a process of building the relationship, getting to know THEM and making them and their voice feel valued. The situations I’m talking about, I think those times would have been a great opportunity to thank the new person (especially new person but ALL people) for sharing, that it was a great thought and we appreciated them giving their heart….. and then the Spirit can guide you into sharing a verse that you equate to that situation or what you feel…. but there’s just a way of doing things and I think we’ve missed it. Isn’t it almost just like people skills 101? We don’t have people skills anymore. Letting others talk. Uplifting each other. etc. it seems to me that I was most defensive before a lot of my spiritual growth happened. Maybe before I trusted the Spirit to do His thing despite all odds… I was convinced I had to convince people. make them understand. but really – like you said you can’t convince people… and so much of our job is to help them open their hearts…. so that they can see the Truth and be open to it. With growth I realized that being defensive or debating NEVER does anything productive for either party. anyway — I am totally rambling this morning and I’m sorry. have a great week! 🙂 great entry thank you!!! but actually I think being defensive NEVER does anything productive…. but I DO think there are times for debate, in the right spirit and tone….but not a debate over personal ideas of the bible/God and not with a new believer you are trying to talk to Jesus about. just wanted to clarify that I actually love “debating” as in conversation of opposing views. but it just never is a wonderful thing to set up one vs. the other when trying to spread the gospel to a non believer. doesn’t work. Hmmm…lots of good stuff here Kathy. Being home for the holidays in Ohio, I am reminded of where I came from. I came from a place of certainty. I tried and tried to convince my “non-Christian” friends, and was frustrated with all of the great questions they came up with. Their questions helped me start to ask good questions and to spot the people who were afraid to admit to themselves that they didn’t. I guess because I was a teen-ager, I was allowed to ask good questions of my church leadership and it was non-threatening to them. Later of course, this was not the case. I think they were more afraid of my behavior though, which was a strong testimony to my questions. I am much more comfortable with uncertainty than certainty. Certainty actually gives me the eebie-jeebies. The reason being, people with certainty are very boring people to hang out with. And…I think because it shows a lack of openness to growth and immaturity in thinking. That’s just me though. I’m thinking that as we open our hearts to these realities of pain and doubt we are leaving more room for the love you have been writing about. We need to be genuine about our doubt and pain at the same time being accepting and loving towards the pain and doubts of our brothers and sisters. Mostly, I would guess, this looks like listening. Real listening without trying to fix, judge, or correct. Not being rushed in listening; having an attitude that this time of listening is sacred. And the more pain and doubt we hear the more sacred the time. Kathy, you said love, love, love I would add listen, listen listen. One of the few times in the past few years that I actually watched a TV preacher, he came up with something pretty good. 🙂 He suggested that doubt is not unbelief, but the place between faith and unbelief. He also suggested that we allow our doubts to move us toward God rather than away from Him. Which makes sense…because doubt arises from unanswered questions, and that should propel us to engage God all the more with our questions. I’ve learned that faith requires an apparent contradiction–that you need faith the most when things don’t make sense. I think that if you’re not struggling in tension with some level of doubt, you’re not really in faith. You’re in denial. I differ with you a bit, Jeff. Placing doubt between faith and unbelief gives it that slippery slope negativity which still keeps it from being Honored. To honor doubt requires accepting the reasonableness which creates it, without throwing everything into faith in reason. If this sound paradoxical, it is. Faith has traditionally been carried on the wheels of mystery in our Christian traditions, we just seem to have lost touch with that. ” The Father uncreated, the Son uncreated, and the Holy Spirit uncreated. This is a wonderfully articulated, well written, and love-filled post. Thank you. Doubt voiced is a wonderful thing. The questions indicate interest – keep’em coming! The worst is indifference. God will answer those questions. Sometimes He takes years because so do we. I don’t think He minds. He loves the seeker, no? We’ll hook up soon in real non-cyber life! Miss you! wow the more and more I think about this and read the comments — it’s amazing to me how many churches don’t have doubt — or should I say – how many church’s leadership pretend not to have doubt. in many churches there is no room for doubt — because they have it all figured out. very interesting. I never thought about this at all. Thanks kathy. If we knew everything – there would be no need for faith. If we knew everything – there would also be no need for the one true God, only room for one we may create. When we don’t allow others to see us with questions/doubt — we are making idols of ourselves to our people. We are making God a billion times smaller than He is. We are not allowing people to practice their faith muscle – so when crap happens they can’t figure out or blows them away with doubt… they have never experienced doubt before, therefore never experienced faith….. and we cast them out for being faithless… The leaders who are casting them out, condemning them for their ‘lack of faith’ are the ones who created them to be like that…. I love how Randi blends doubt and faith. This need for certainty, absolute “truth”, etc. may be our way of recreating the Original Sin in the Garden. We want to be God in our control and understanding of all creation. We are afraid to let God be God and instead we tell God what She should be. Sage brought this into our conversation with ‘Mystery”. Let’s read the Athanasian Creed and except doubt as a way to pray and approach God. I was visiting a large and growing church. The Lead Pastor actually said, ‘If you don’t agree with and support everything I say you should leave’. I cannot believe that his absolute certainty had anything to say about God, but a lot to say about his own “Original Sin”. randi – thanks so much for sharing that story, i think it fits so well in this conversation & is such a telling example of how easy it is to just spout out “proper” answers and think that’ll do the trick instead of honoring the questions. and yeah, i got you on the debate part. we love to debate in all kinds of ways around here, but there are times & places for it and i think i like the idea of spirited conversations more because i think that’s the big idea. but it definitely does depend on the context & the relationship where it is possible. when we think of debates we think of winning or losing & that usually sets up a bad scenario. in real conversations, even with differing views, the idea is to understand each other better. i can think of how many times in the olden days i used to try to convince people of what the bible said and how dumb it was to waste my energy on that conversation. i could have been asking questions, i could have been listening more, i could have been doing all kinds of things other than trying to prove a point! anyway, i am glad that these conversations are stirring up all kinds of things, thanks for reading & sharing. lisa – love your thoughts. looking back, i do think that some of what i would do was based on an immaturity. i saw things as so black and white, but i have come to see that so much about real life, the complexities of real faith in a real world with real people is much much much more gray! doug – yes, i am so with you. listen, listen, listen. that is one of the ways we love, love, love. i really like what you said here, too, about the idea of God being in our control, of making God a reflection of what we think God is supposed to be or what we feel safe and comfortable with or what serves our purposes for power & control. such an excellent thought, doug, so much to ponder! and on your church experience, i am utterly and thoroughly amazed what people submit their hearts and time and minds to. i guess that company koolaid works? jeff – i really connect with what you said here: faith requires an apparent contradiction–”that you need faith the most when things don’t make sense. I think that if you’re not struggling in tension with some level of doubt, you’re not really in faith. You’re in denial.” i found myself the other day praying in a way i haven’t prayed in a long time, just feeling really desperate and it is hard to explain but i just felt this weird sense of “oh, that’s right, this is what this moment looks like when i have to draw on my faith in more than just words…” this is the rubber meeting the road somehow. weird. i don’t know about the faith-unbelief continuum with doubt in the middle, but i definitely agree that doubt isn’t just unbelief (which is what i used to think) but doubt definitely points me toward faith. my questions draw me into relationship with God. like susan said, that is the engagement between us, the thing that builds relationship, the tension, the unanswered-ness, the gaps, the longings. sage – beautiful creed, leave it to you to share something so lovely. thanks. i really like the contrast you brought up and the idea that “To honor doubt requires accepting the reasonableness which creates it.” julia’s question was such a good one, such a reasonable one. matt – okay that is so good, really good. hadn’t heard that one from rob bell before. thanks for sharing. phyllis – thanks my friend. susan – always so good to hear from you here. i haven’t seen you forever!! yep, i am so with you. God can hack it. randi – i think you hit on the head “pretend that they have no doubt.” oh the damage that has been done over that one pretense! i love how you articulated this! Great discussion here — what I like most about your post and the comments is the sense that doubt is not the opposite of faith. In many ways, doubt is actually a necessary precondition and a proving ground for faith. Without doubt, we’d have no opportunity to exercise or act on our faith. Perhaps faith is best demonstrated not by intellectual certainty, but by personal trust and commitment? Not being sure of our destination, but being sure of the one who leads us? I am grateful for this Blog Comment Day in that it has brought me to your site. I will have to check back in here regularly. Thanks for your honesty and words of wisdom. The church needs to hear them! Kathy – Great post and discussion – I would like to add that I think that doubt is a natural part of “spiritual growth” and that when we do not make a place in our communities for people to talk about and struggle with their doubt then we are actually stunting their growth. Somewhere along the line we got the idea that spiritually mature people had all the answers about everything. I know that no one really believes that but there is some sort of emotional reaction that we have promoted that seems to cause people to think that doubt means something has gone awry and needs fixing. Asking God questions does not equal doubt,how sad to think we can not dialogue with God openly and honestly. Picking my Grandson up from preschool the other day – he asks, you will come and get me, eh Pop? – Does he doubt me, does he think I won’t pick him up? no, why should he? – is he asking for reassurance? – I think so and confirmation of my promise that I will be there, is this doubt I kinda don’t think so. Is it a realtionship – definately. I just re read my comment – it doesn’t read well. Doubt is okay, indeed it is – but asking questions of God doest not always mean doubt. It is normal, we are in relationship. So… how do you think it would work if you were my pastor long distance? After reading your post the first time I “commented” (HA!) by writing a blog. Kathy–I’m with Katherine Gunn, though I guess I get that cyberspace does away with a lot of the risk inherent in, in the flesh relationships so it probably isn’t the best case scenario. Your children are brillant–catching you when your hands are on the wheel and you’re staring at the road ahead! chad – thanks so much for stopping by. blog comment day was a fun experience 🙂 that is a powerful story, your parents. thanks for sharing. one of the most sad things to me is how many christians do not have places to express doubt & inadequacies & fears. the result is never good. i love that yancey quote: doubt is the skeleton upon which grows the flesh of faith. oh that is so good. yes, this idea that somehow doubt is weakness is so terribly sad to me. i think it is a sign of strength, of courage, of a desire for real intimacy with God. look forward to hearing from you again! gracerules – amen!!! love your thoughts here! 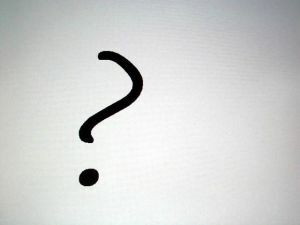 mark – yeah, i think they are two different things–question asking & doubt–that often intersect. but honesty is the key ingredient–honesty & safety to ask questions, to live in the tension, and learn to trust the relationship can hack it. katherine – 🙂 i am glad we all have each other out here in crazy blogland. it’s amazing how hearts can get connected & i am glad you are part of this community from afar. minnow – yes, the little monkeys are quite brilliant, aren’t they? for me, yeah, there’s nothing like face-to-face across the table with a good cup of coffee & lots of time. one of the most beautiful things for me in the past few years is actually meeting more than a couple of the friends i have met out here in person, either at conferences or because they came to denver or ?. so, hint, hint, hope it happens someday! lionel – thanks for reading. to me, that is one of the best things, to disagree but to be able to learn from each other. YES, Kathy! Most church leaders run from doubt. It’s like I’m 7 years old again asking “Why?” and I get the “because I said so” or “that’s just the way it is” answers. I’m probably on a lot of prayer lists right now because the Sunday School answers haven’t cut it with me for 6 or 7 years now. I believe my faith is stronger because of doubt, not weaker. All the synonyms for doubt are felt toward humans with whom we have a relationship; why can’t we have those same feelings toward God with whom we also have a relationship? Doubt causes me to search deeper for truth – that’s seems to be where I find Jesus the most – in my own search, not in a sermon telling me how I should believe or from a deacon telling me I can’t serve because my wife is divorced. By the way, great introductory quote.